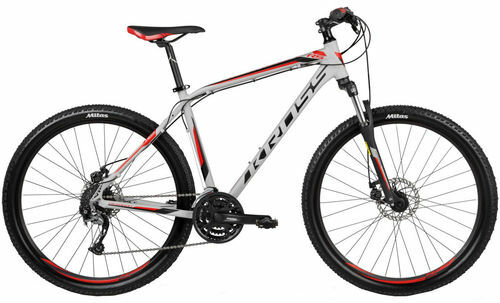 Шины Mitas Ocelot 27.5" x 2.1"
MTB bikes are suitable for any kind of landscape. These models are perfect both for an easy rides, gravel roads, tourist routes or mountain forest tracks. Hexagon line combines high quality of Kross frames matched with shimano components for an affordable price. The aluminium performance 6061 alloy means that the frame is highly stiff and resistant to breakages, while retaining the light mass typical for aluminum. Guarantee large brake force and good modulation of it even in the most severe weather conditions, they also last for much longer than traditional brakes. Method used to shape tubes by pressurized liquid injection. This technology primarily creates a lighter structure characterized by higher durability and precise finishing. We created a system of exchangeable dropouts in order to protect our frames as much as possible. In case of damage they can be easily and quickly exchanged. Screws or a special nut are used for the dropout in order to minimize frame damage.